Rothman was also well known as a champion of UCSC's seventh college, Oakes, which he joined as a lecturer in 1973 when he was 28. While Rothman is recognized for his lasting imprint on Oakes College, he is also well known for developing writing courses that helped students from all backgrounds and majors find their voice on campus and engage with the wider world. 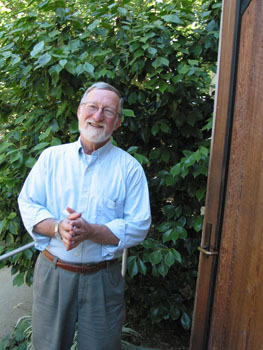 "Don cared deeply about students and was innovative in his approach to writing instruction, which he regarded as crucial for all students, especially first-generation and underrepresented students," said UCSC Chancellor George Blumenthal, who met Rothman during the early years they shared on campus as fellows of Oakes. "There are thousands of alumni, from places around the world, who owe much of their success to Don's tireless commitment to teach communication skills. We all feel an enormous loss with his passing." Rothman was especially dedicated to exploring the promise of writing to enhance democracy, especially in the area of non-violent persuasion. He believed writing could bridge student differences, whether those differences were based on socioeconomic status, gender, or subject of study at UCSC. In the process, Rothman inspired the rest of the campus at a time when UCSC was refocusing its commitment to writing instruction that could serve undergraduates from all backgrounds and disciplines. He also served as a mentor to his faculty colleagues for decades. "Don played the role of the person who made us always want to question and see what we had forgotten, or whether we had gotten complacent," said Carol Freeman, senior lecturer emerita in writing. "It's too easy to become self-satisfied. In any kind of organization, you need to have someone play that role. And for him to do this, while at the same time remaining positive and pleasant, was invaluable." Paul Skenazy, a professor emeritus of literature, remembered his former colleague's intelligence, quick wit, and far-ranging curiosity. "Conversation was at the heart of Don," Skenazy recalled. "He was one of those people who made you feel more interesting than you were. He wanted to talk about where your vision of the world came from. We would often meet and just talk, and the world became richer and fuller for me because of it. Don would open up possibilities of a story or incident that I wasn't seeing myself." Three years after Rothman retired as a senior lecturer in 2007, he delivered the commencement address at Oakes. "I came here to teach writing as if the world depended on it," he said at the 2010 commencement. "That is, I imagined that helping students, very much like today's graduates, learn to express themselves in writing with passion, purpose, and pleasure could make the world more just." During the most recent Alumni Weekend celebrations on campus, held this past April, Rothman joined his old friend and former colleague, the founding Oakes College provost Herman Blake, for an informal talk that spanned the history of UCSC. The public discussion, which drew a capacity crowd to the Humanities Lecture Hall, delved into the founding values of UCSC, the growth of its colleges, and the challenge faced by today's educators. These two old friends and former colleagues also spoke of the importance of "listening eloquently." "One thing hasn't changed," Rothman told the audience. "If you attend an Oakes commencement, sit up on the stage and look out at the crowd, look at the families and their faces, you will understand what is at stake here. You'll see the look on the faces of parents who are there for the first kid in their family to graduate from college." Rothman also carried his commitment to education off campus. Four years after starting work at UCSC, Rothman founded UCSC's Central California Writing Project (CCWP), which he directed for 27 years. The CCWP is dedicated to improving the quality of writing instruction in Santa Cruz, San Benito, and Monterey counties, with a focus on kindergarten all the way through college. CCWP summer institutes for teachers held at Oakes brought education activists together to think imaginatively and courageously about how to teach writing to change the world. Many of Rothman's publications address this subject, including a long interview in Higher Education Exchange published by the Kettering Foundation. He was fond of saying, "We write to avoid the humiliation of silence in the face of cruelty and injustice." Rothman, who twice served as acting provost of Oakes, also served on many Academic Senate committees, including the Committee on Planning and Budget. He also was a longtime supporter of Shakespeare Santa Cruz, and for many years served on the theater company's board of directors. A Humanities Division award for undergraduates, the Don Rothman Writing Award, honors the achievements of one or more first-year students in the genre of nonfiction, academic, analytic writing, and recognizes excellence in writing pedagogy. Rothman not only could teach writing, he was an author who combined his lifelong interests in writing and photography in his book One Way of Seeing: Photographs and Essays During a Time of Reflection. He also wrote Looking for Bethlehem, a collection of photos of a defunct Pennsylvania steel mill, and How To Teach Writing … and Why, which codifies his guiding principles from 40 years of teaching. Rothman's survivors include his wife, Diana; his children, Dov and Naomi; his grandchildren, Claudia and Paloma; and his daughter-in-law, Anne. A public memorial will take place at UCSC; details will be announced at a later date. To make a donation online to either program, please click here. Or you may make a gift by mail: Donations should be made payable to the UC Santa Cruz Foundation, with a note to the fund being supported, and sent to University Relations, Attn: Kathy Rouhier, 1156 High Street, Santa Cruz, CA 95064. Thank you.